With the memory of their close exit in semis at the hands of Western Kikio in the last championship Makira Ulawa Sharks were playing at another level this year and they even had the energy to up their antics in the final game. As soon as the whistle signalled they were on their way and very soon the goals started coming. The day’s top performers for Makira Ulawa Sharks were Ian Ngahugari and Cecil Buru but it was Matthias Saru’s double that did the job for them. By the end of the first third they were 2 – 0 in front and they completed the second third 3 goals in front. 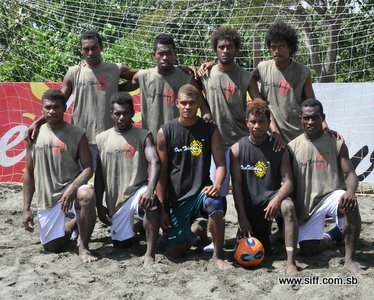 A strong fight back from Honiara West what they had to deal with in the final but deal with it they did as they emerged 4 – 2 victors. Muri was the first to find the back of the net for Makira Ulawa Sharks, his goal came 4 minutes into the first third and their fans plus everybody else who was not supporting Honiara West were jolted into cheers. The lead went to 2 nil when Saru slipped his shot past the opposing defenders and all the way past the goalkeeper. The second third saw some defensive strength emerge from the Honiara West but they were matched at the opposing end with the same determination to prevent goals from going in. However, when the opportunity to score was presented to Ngahugari from a free kick he wasted no time in getting the ball past Clement Kalibiu who was not at his best on this fateful day for his team. That proved to be the only goal of the second third but it was enough to see Makira Ulawa extend their lead to 3 – 0. It was a do or die situation for Honiara West when they took the pitch for the final third and hope was rekindled in their fans when Thomas Taloga got them on the board with their first of the day. This goal was cancelled as quickly as it came when Matthias Saru somehow slotted the ball past Kalibiu for the second time and the 11th time in the competition, thus, making himself the clear claimant to the golden foot award. However, the job was not yet done for his team and they were reminded of that when Michael Misitana scored to bring the score line to 4 – 2 with the bulk of the third yet to be played. Unfortunately for Honiara West, that was their last goal of the day and Makira Ulawa Sharks held on to win the game. The Makira Ulawa Sharks accolades for the day did not only stop with the national trophy and the $12 000 prize but they also scooped up most of the individual awards on offer. The best player award went to Muri who was outstanding for his team throughout the championship. The golden foot award was given to, Matthias Saru, who scored a total of 11 goals in his debut championship but that will be a mere bonus since he is likely to receive a call up for the next training squad for Bilikiki, the national beach soccer team. For the second time running, the golden glove award went to George Lifu who probably was the biggest contributor the Makira Ulawa Sharks success story this year. His acrobatic ability and quick eye won him the admiration of the spectators, his opponents and also the national selectors. Last year, Lifu also won the same award while playing for Western Kikio. The fair play award went to their sister team, Makira Ulawa Eels for a fine year for Makira Ulawa Football Association in the beach code. Unfortunately, the third and fourth final between Honiara East and Northern United scheduled to take place earlier in the afternoon was cancelled after the former was disqualified for fielding an unregistered player in 2 of their group matches. An exhibition match between Northern United and Makira Ulawa Eels was held instead and Northern United won the game by 10 – 5. All monies quoted in Solomon Islands dollars. All prizes, trophies and medals were sponsored by Our Telekom.